Question 1 cpu core hitting 88% ?!?! Am i hitting a bottleneck? ^<------- No recording required easy and beautifull. Guild wars 2 - Vysync 60 fps out in the world 30-40 fps in towns Now adjustable settings here and there i was able to maintain 60 fps in large towns without vsync <---- feel like maybe the games unoptimized or somethings wrong with this pc. ^<------- This game is so un-optimized I didnt bother recording it didnt want to stress things any worse than they were. Apex Legends - Vysync 60 fps before we drop from the ship it drops to 40 fps as soon as i land it levels out pure 60 fps odd server lag here and there but i feel like i shouldnt be dipping now without vsync 90-144 fps but screen tearing is UNBEARABLE! looks really good but its been deteriorating ever so slightly Never got to unvsync it. Eso (elder scrolls online) - pretty perfect, other than some events i dip a little under 60 to about 44 fps without vsync it drops for 80-40 fps at certian spots <--- my old pc witch is garbage ran eso max just fine! NOTHING IS OVERCLOCKED OTHER THAN XMP FOR RAM. Well, games that are not well optimized for multiple cores will do that. That said, if it's never actually hitting 100%, then even that one core still has headroom. Tearing will occur without VSync. VSync exists as a setting in games, regardless of monitor. 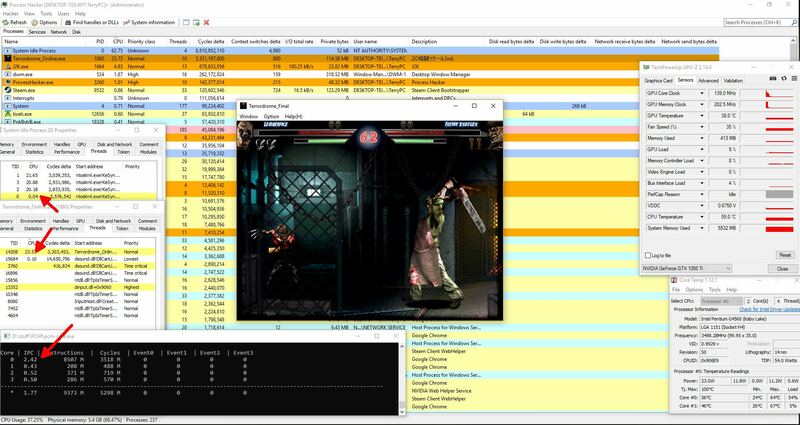 The game waits until vertical sync before displaying the next frame. If you turn Vsync off, you may have the top part of the screen displaying one frame, then the tearing and below the tear-line, the next frame being displayed at the lower part. Gsync and FreeSync are both adaptive sync technologies, and basically adjust the refresh rate on the fly to avoid tearing and maintain smoothness. Previously, with AMD cards, you use FreeSync, and Nvidia cards, you use GSync. However, GSync monitors require extra hardware from Nvidia, and cost more. Fortunately, with the most recent drivers from Nvidia, they are starting to support working with FreeSync monitors. What is your monitor's resolution? 1920x1080p 60 hz insignia screen around 46-50 inch. The performance you are getting especially with Vsync on is to be expected. Your setup is far more capable than that screen can demonstrate. Get yourself a 100hz or 144hz monitor with Gsync or freesync (the driver supports freesync now too), and you will get rid of all that tearing and run at a much higher visible fps. Ha, no problem. TVs also have much worse latency than a good monitor. They really aren't good for high fps gaming. 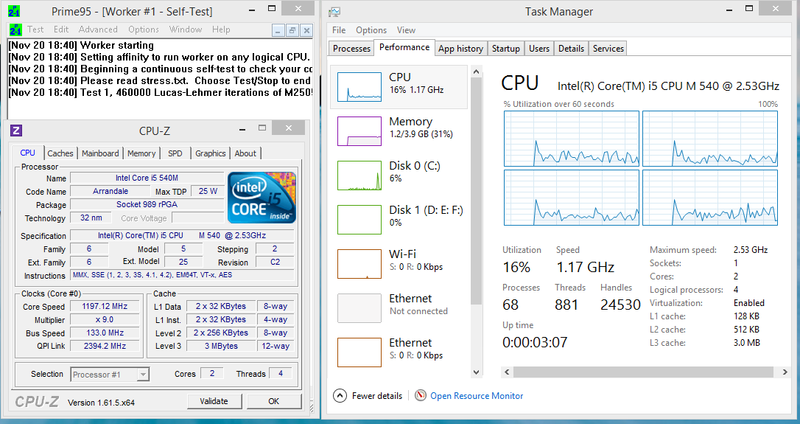 Either way your system is running correctly, one core will always be working more, but 88% is not maxed out, obviously. Nothing to worry about. Either way your system is running correctly, one core will always be working more, but 88% is not maxed out, obviously. Nothing to worry about. Since tools like afterburner and task manager show you an average usage over time and because windows is juggling threads around the physical cores to keep one part of the CPU from heating up more then others,that 88% is 100% 100% usage on one core. Since you didn't overclock anything you should really monitor core clocks while gaming because motherboards have wildly different default settings,your CPU might be running slower than it could. im going to overclock. just gotta get the guts todo it just scared! No, its not. If it was showing total CPU usage as 88% then you could theorize that more than 1 core is at 100%, but if it is showing a single core at 88%, its 88%. It may have spiked to 100%, which does not matter, bu its running consistently at 88%. The only (other) reason to be consistently stuck at 88% is to have a consistent 12% bottleneck from the GPU or vsync,which is improbable because both CPU and GPU usage changes wildly depending on where you look and what you do. Anyway there is software out there that will show you thread usage in real time and not as an average so you don't have to guess. no 100% on one thread (half of a core due to HTT) and the rest is just background noise. Again, no. You can have a game that doesn't even max out a CPU core. Try playing For Honor for example. That game will barely go over 50% core usage on my system. You do not measure a bottleneck in percentage that you are not using of a CPU core. I don't understand your aversion to average scores. You can use afterburner, reset it to start when you want it to (say after the game is running) and clearly see in the charts what range its running in and a reasonably accurate average usage, per core, and total. So you seriously believe that games can use a core to only 50% ?They only use half of the available speed? How does that happen, is the game just giving up? Process/thread Migration is a real thing read about it,this image is of one single thread of prime95 running normally under windows,it shows up as a % of usage on every core just like for honor is showing up for you because windows is juggling the threads around and task manager is showing you an average. I seriously do believe that because it is true, For Honor is a GPU bound game. There is a minimal difference between most high end CPUs in performance in that game, and to get a significant framerate difference you need to drop down to something significantly slower like an FX-8350. Question CPU temp increases every second and when it hits 108 degrees celsius PC shuts down. Question When starting high end games cpu hits 100% and then computer blue screens. Question My CPU hits 80-100'C when playing Anthem, should I be worried? Question I'm hitting 85c on stress tests with r5 1600 and stock cooler. Question Does a CPU affect hit registration? CPU hits 80 when playing games. Never did this before 2 new RAM sticks? Question SSD Partiot Burst or ADATA for laptop? Question Do I need 750W or 650W PSU?